Baltimore cop to plead Fifth in colleagues trials for Freddie Gray death. 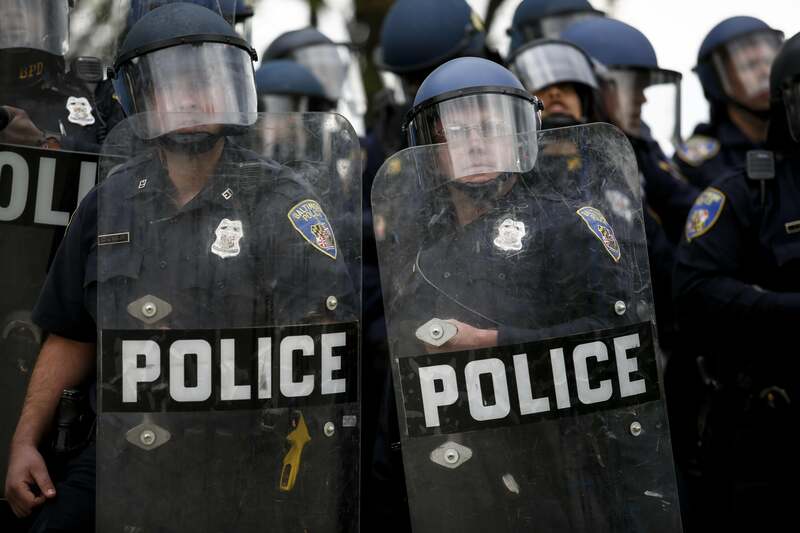 Baltimore Police officers in riot gear on Apr. 27, 2015 in Baltimore, Maryland. The legal team for Baltimore Police Officer William Porter took steps Tuesday to keep him from being called to testify against his colleagues for the death of Freddie Gray in April. Porter’s lawyers filed a motion with the court saying he planned to invoke his Fifth Amendment rights and that he cannot be compelled to appear as a witness in the trials of fellow officers Caesar R. Goodson Jr. and Alicia White. Porter’s assertion of his constitutional right against self-incrimination could complicate the prosecution’s case against the other officers. Porter was the first of the six officers charged for the death of Freddie Gray to go to trial for manslaughter, assault, reckless endangerment, and misconduct in office for failing to buckle Gray into the back of the police van, but last month a hung jury resulted in a mistrial for the office and a second trial is scheduled for June. That makes Porter the last to be tried and changes the prosecution’s calculus because questions of self-incrimination, which wouldn’t have existed if he had already been convicted, now loom large. Jury selection in Goodson’s trial is scheduled for Monday. White’s trial is scheduled for Jan. 25. Prosecutors have said Porter is a “material witness” against the two… Porter’s attorneys say their client will assert his right not to testify in Goodson’s case at a pretrial hearing on Wednesday, at which prosecutors plan to propose that Porter be given immunity to speak without his testimony being used against him at his retrial. The defense says the state believes such immunity would eliminate Porter’s ability to invoke his Fifth Amendment right against self-incrimination, forcing him to answer questions under penalty of contempt. Such an arrangement is known as “use and derivative use” immunity. It is different from “transactional” immunity, which would assure Porter would not be charged in the crimes to which he testifies. The latter has not been offered by the state. If Porter is compelled to testify under the proposed immunity arrangement, his attorney’s argued, it would fail to protect him in several ways — thus abridging his constitutional rights.